On January 1, 2014, New Mexico joined with eleven other states to enact the Uniform Real Property Transfer on Death Act (URPTODA), found at Sections 45-6-401 through 45-6-417 NMSA 1978 (2014). This enhances and adds clarity to the previous transfer on death statute already in force in the state. 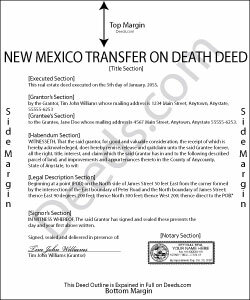 A transfer on death deed (TODD) under the new law is defined by the Uniform Law Commission as an instrument that provides owners of real estate in New Mexico with a simple process for the non-probate transfer of real estate. The act allows an owner of real property to designate a beneficiary who will automatically receive the property upon the owner's death, without the need to include it in the decedent's probate estate. Instead, the property passes by means of a recorded TODD. During the owner's lifetime, the beneficiary of a TOD deed has no interest in the property and the owner retains full power to transfer or encumber the property, or even to revoke the deed outright. 3) it must be recorded before the transferor's death in the public records with the clerk of the county where the property is located. TODDs represent a potential future interest, conveying whatever rights, if any, the owner retains in the property at the time of death. So, unlike inter vivos deeds ("traditional" documents such as warranty or quitclaim deeds), a TODD does not require notice, delivery, acceptance, or consideration ( 45-6-410). The transferor (owner) under a TODD must meet the same standards for capacity as someone who executes a will, but the deed is not affected by the terms of the deceased owner's will. For example, Mary executes and records a TODD leaving her house and land to Bob, and then leaves the same property to Joe in her will. In most cases, Bob gets the land and Joe gets nothing. If Mary actually wanted to leave the land to Joe, she could execute and record a revocation of the transfer to Bob, then record a new TODD in Joe's name. Alternately, she could sell the land to someone else entirely, and include a statement in the deed, revoking all or part of any previously recorded TODDs. See Section 45-6-411 for more information. TODDs also offer some flexibility to beneficiaries. If the recipient is unable or unwilling to accept the transfer, Section 45-6-414 authorizes a beneficiary to disclaim all or part of his/her interest as provided by the Uniform Disclaimer of Property Interests Act [Chapter 45, Article 2, Part 11 NMSA 1978]. Overall, New Mexico's statutory transfer on death deed is a flexible estate planning tool that allows owners of real property in the state to convey a potential future interest in real property to one or more beneficiaries. The transfer may be changed or revoked at any time during the owner's life, simply by recording the appropriate documents. Each situation is unique, so carefully review all the benefits and drawbacks of this and any other real estate decisions. Seek legal counsel for help with specific questions or complex situations. Lajeanne F. said: Your service was as you promoted and I was able to get a copy of my deed and find the information on it I needed. Thank you.